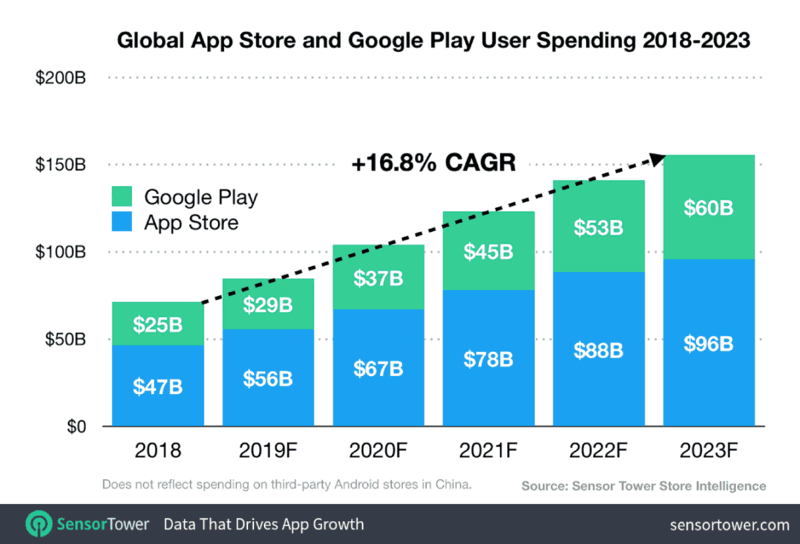 Apply and Google, app distribution platforms have been doing huge business through apps, Apple store for iOS and Google Play Store of Android had a total user spending on apps of around $72 billion in 2018. The app market is expected to keep growing at a higher rate and a report suggested, the user spending of both the platforms will reach $156 billion by 2023. Sensor Tower, an analytic and intelligence firm prepared a report according to which there will be a 120 percent growth in the app market in the coming few years. The Apple inc. is going to stay above Google in a number of apps it holds. The user spending of the App Store for iOS will is $96 billion whereas the Google Play Store will have around $60 billion. This does not include the third-party app stores of Android devices in China. App Store has higher app spending because iOS devices are not only expensive but also are more popular in developed markets. Though Android devices are more in number the spending on apps is not high. The developing markets are more attracted to the free apps and games available rather than spending on apps. The Asian specific region has been contributing to the app spending much and there will be a 90 percent growth by 2023. Whereas, Latin America, Africa, and Middle East growth will be 200 percent.